Where do our things really come from? China is the most common answer, but Thomas Thwaites decided he wanted to know more. In The Toaster Project, Thwaites asks what lies behind the smooth buttons on a mobile phone or the cushioned soles of running sneakers. What is involved in extracting and processing materials? To answer these questions, Thwaites set out to construct, from scratch, one of the most commonplace appliances in our kitchens today: a toaster. 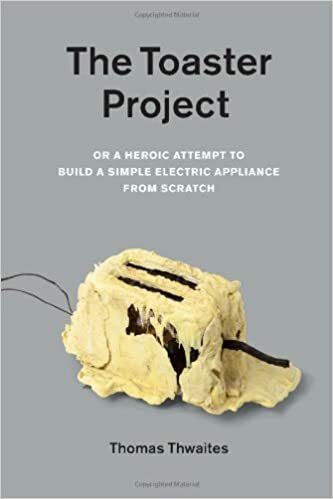 The Toaster Project takes the reader on Thwaites s journey from dismantling the cheapest toaster he can find in London to researching how to smelt metal in a fifteenth-century treatise. His incisive restrictions all parts of the toaster must be made from scratch and Thwaites had to make the toaster himself made his task difficult, but not impossible. It took nine months and cost 250 times more than the toaster he bought at the store. In the end, Thwaites reveals the true ingredients in the products we use every day. Most interesting is not the final creation but the lesson learned. The Toaster Project helps us reflect on the costs and perils of our cheap consumer culture and the ridiculousness of churning out millions of toasters and other products at the expense of the environment. If products were designed more efficiently, with fewer parts that are easier to recycle, we would end up with objects that last longer and we would generate less waste altogether.